How do you solve a problem like St Pancras? If you’re writing a blog which features examples of beautiful transport infrastructure, then it’s almost inevitable that St Pancras is going to crop up eventually. The trouble is, it’s so famous that it’s virtually impossible to find a fresh angle on it. However, we’ll have a go by looking at some of the smaller details which make it such a special piece of transport infrastructure. St Pancras International (to give it its current name) is the glittering jewel at the heart of the British railway network. It is the London end of the Midland Railway’s main line, a function it has served since it opened in 1868. It is also the London end of the bizarrely circuitous High Speed 1, Britain’s first, only, and diminutive (at 68 miles long) high speed railway, which links London with the Channel Tunnel and mainland Europe. This latter job it has been doing only since 2007. It’s the station we got instead of King’s Cross International, and while that lost station might have been something special, in the end we got something even better. 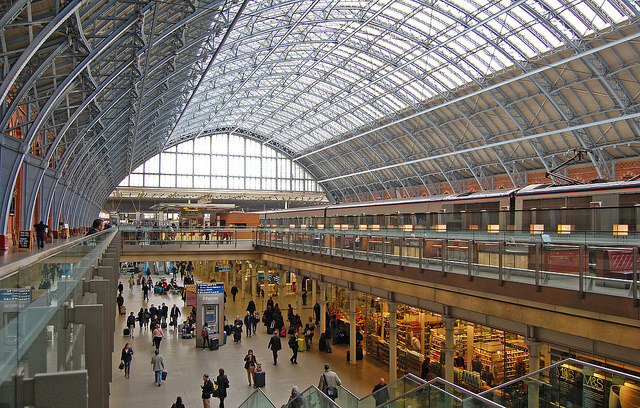 St Pancras International is an important station for many reasons, not just its position as London’s international railway station. It is important because its reconstruction for international services, under chief architect Alastair Lansley, has given Britain an example of what a railway station can be when sights are set high. It is one of the few transport sites in the country that are destinations in their own right, visited by people who have no intention of catching of train. I know of people in the media industry who hold meetings in the bars and restaurants there, so fashionable is St Pancras. It’s hard to imagine similar meetings taking place in most other British railway stations. From this blog’s point of view, St Panras is also important because it’s widely recognised as a superb piece of city-enhancing design. Perhaps even more importantly, it has achieved that recognition despite the fact that construction of the station was mired in controversy, and seen as almost wilfully destructive. In order to construct St Pancras, an entire district of a London (Agar Town, a notorious slum, but still, you know, somewhere that quite a lot of people actually lived) was levelled and a large graveyard (along with its residents) was gruesomely disturbed. Today, nobody who stops to admire St Pancras recalls that controversy. That’s a very important lesson for Britain’s proposed High Speed 2 line, and the ongoing hand-wringing over the disruption its construction will cause. The lesson is that after a few years, no-one will even care. So you might as well get on and build it, and build something spectacular while you’re at it. Which is precisely what William Henry Barlow and George Gilbert Scott did when they worked on St Pancras. Barlow engineered the actual station, and his vast iron trainshed roof has no supporting columns and no trusses, at least as far as passengers of the day could see. In fact, the arch was tied together at its lower ends, underneath the platforms, where it was supported on a grid of iron columns. Scott’s Midland Grand Hotel, which is the iconic street-facing part of the station (the bit that’s all neo-gothic arches and spires) was completed a few years after the station opened, in 1873. Over the decades the station slowly fell out of favour and into neglect. By the 1960s it was threatened with demolition but the outcry over the loss of the Euston Arch, a few metres down the road, galvanised efforts to save it. 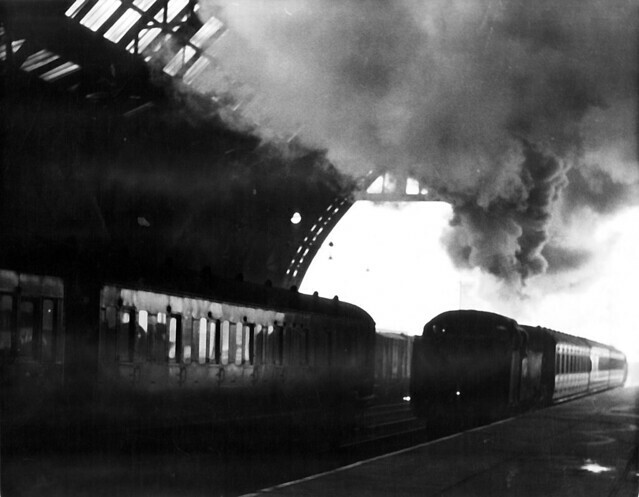 It soldiered on until the early years of the privatisation of British Rail, leaking, dirty, draughty (the glass screen at the end of the platforms having been removed to allow smoke to escape more easily) and dark. Its roof had been damaged in the war, and repairs had left it with much less glass than it originally sported; even the remainder was badly stained. By the early 2000s its fortunes had been transformed. It was being reconstructed, rebuilt and extended for its new role as the terminus for Eurostar services to Brussels and Paris. Lengthened platforms and a new canopy to the north catered for the long Eurostar trains, while domestic trains were moved to either side of this northern extension. 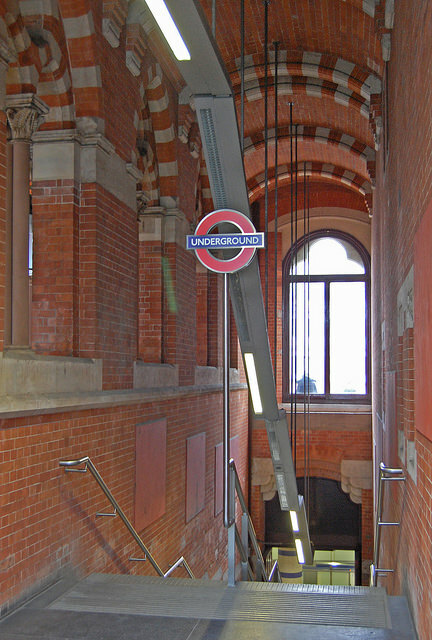 The whole of the original station was completely renovated for its new role, with international services from St Pancras commencing in 2007. The story of this reconstruction was featured in a six part BBC television series and has been recounted in countless books and articles. 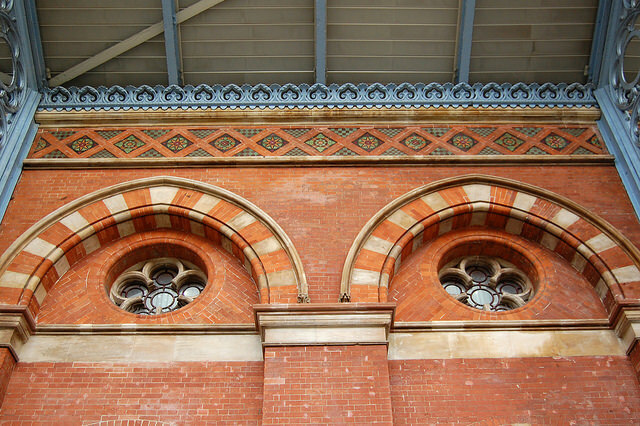 But if you really want to see what’s brilliant about St Pancras International, you have to look at its details. They demonstrate remarkable care and attention in the design of both the original building and its restoration, and are of a quantity and quality rarely seen in transport architecture. This is one of the pillars that supports the trainshed. It’s now visible to passengers because the station’s reconstruction opened out the undercroft level below the platforms, cutting huge slots into the platform deck on the west side of the station, allowing light down into the shopping arcade below, where Eurostar’s departure lounge can also be found. The spaces between the pillars are defined by the size of a barrel of Burton’s beer, one of the main category of goods handled by the station when it originally opened, as the Midlands quenched the thirst of London’s drinkers. 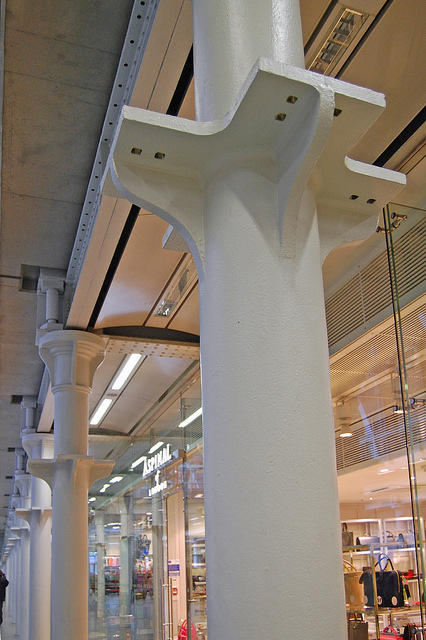 The pillars have a cross-shaped bracket towards the top, which has proven extremely useful in the station’s reconstruction, supporting cameras, information screens and other bits and bobs as necessary. 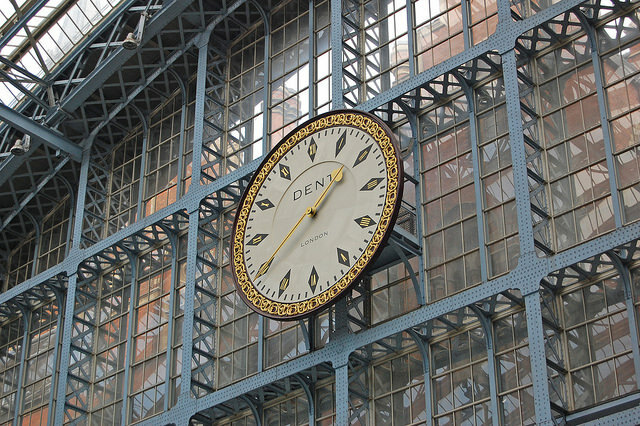 The great station clock is much photographed, but is not the original. Neither it is a restoration of the one in the station during the latter half of the 20th century, which was a cheapo 1975 facsimile made from fibreglass. However it is a faithful replica of the original 1868 clock, with a slate base, stone inner ring and cast concrete outer ring. The rhombus-shaped hour markers are also made of slate, while the hands and other details are picked out in gold leaf. 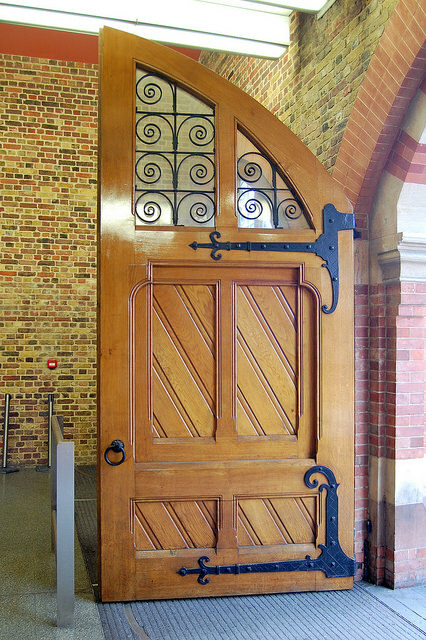 The solid oak doors at the side of the station are simply stunning, replicas of long-lost originals. They demonstrate the level of care and attention which went into the original station and its subsequent restoration, and explain why the station is so admired. The side walls of the station do not provide any support to the iron roof, which holds itself up just fine on its own. This gave great flexibility to the Midland Railway in planning the location of facilities around the edge of the station. 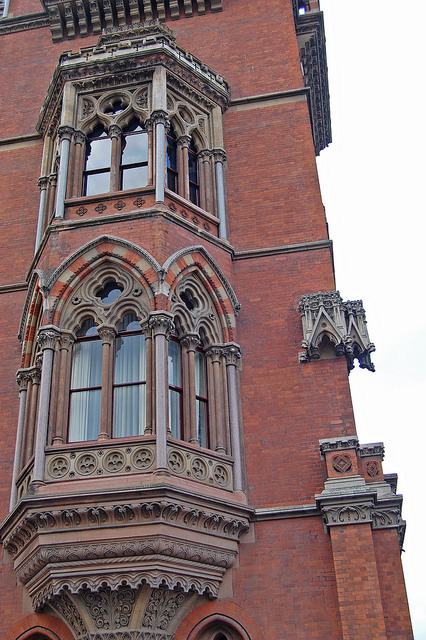 At the top of the side walls runs a frieze of Minton tiles, almost impossible to see in the gloomy days of St Pancras before it was reconstructed. Now, cleaned and well-lit, this charming detail is vivid and surprising. You can see the pride of Barlow and Scott in their work at countless locations. It extended to contractors too. Here, again much more easily visible now the station has been restored, is the Butterley Company of Derbyshire letting you know who you can thank for manufacturing and installing the station’s ironwork (it would much later go on to supply the steel components of the Falkirk Wheel). 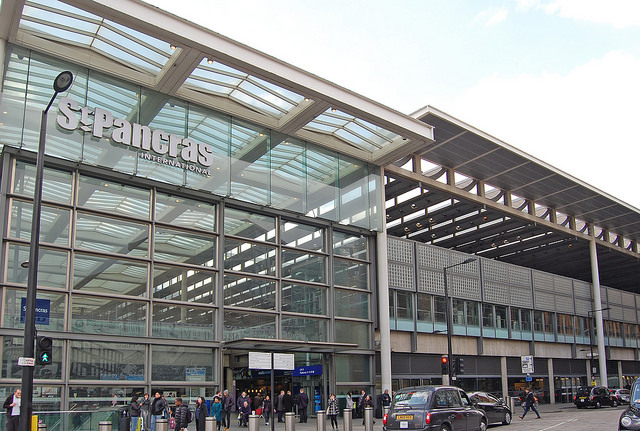 There are several ways in and out of the London Underground from St Pancras. The new entrance which links the Underground to the shopping arcade in the undercroft level of St Pancras, through what used to be the basement of the Midland Grand, is the main one. However, I suspect there can be only a few London Underground entrances which are more atmospheric than this one, at the south end of St Pancras’s platforms. These are places where statues ought to stand, but where the largesse of the Midland Railway finally gave out. In order to save money, all but one were left empty. All around the station, polychromatic brickwork abounds and gargoyles peer down. It’s no wonder the exterior of St Pancras featured in the Harry Potter films, even though Harry’s Hogwarts Express departed from next-door King’s Cross. St Pancras is a station fit for wizards. King’s Cross is for muggles. Alone amongst Britain’s major stations, St Pancras International is not managed by national railway infrastructure operator Network Rail. As such it has a unique visual identity. While Network Rail employs a font called Brunel on signage at its stations, St Pancras employs a different, specially created font. 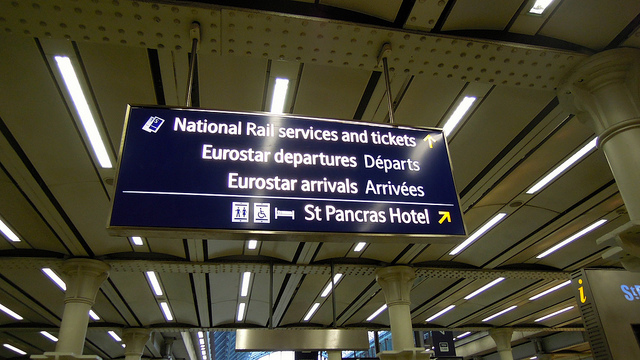 The design work on the signage at St Pancras was carried out by Transport Design Consultancy (see here). 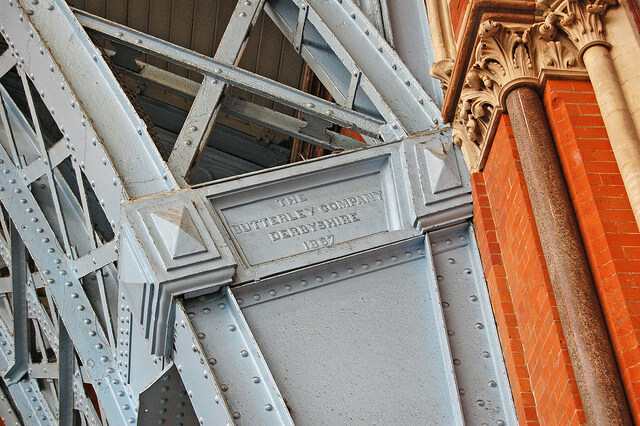 It needed a condensed font to fit onto signage which would be installed between the iron columns under St Pancras’s platforms (yes, them again) and commissioned typeface designer Dalton Maag to create the Barlow font, named after St Pancras’s engineer. It’s a friendly, airy font with a strong vertical emphasis (its letters are only 81% as wide as those of Helvetica), entirely appropriate for the lofty environs of St Pancras. It was subsequently extended to all signage at stations on High Speed 1 (see here). Each station on High Speed 1 has its own logo, that for St Pancras International mostly being in the Impact font, except for a curiously sort-of-gothic ‘t’. The logo is probably the least satisfactory element of St Pancras International, an uncomfortable mix of a font of which it is hard to be fond, and the unsuccessful attempt of the ‘t’ to recall the station’s gothic splendours. Mind you, if that’s the biggest problem I can find with the station, that tells you how good the rest of it is. My favourite piece of detailing at St Pancras is, of all things, the door furniture in the old part of the station. 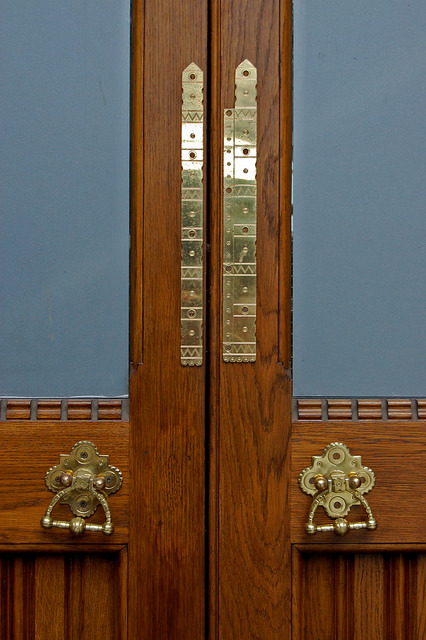 New doors were added in the western wall of the station, but all doors feature these exquisite pieces of hand-wrought brasswork, faithful replicas of the metalwork on the original doors in the station. They are miniature distillations of Victorian neo-gothic, perfect accompaniments to the larger-scale extravagances of Scott’s architecture. 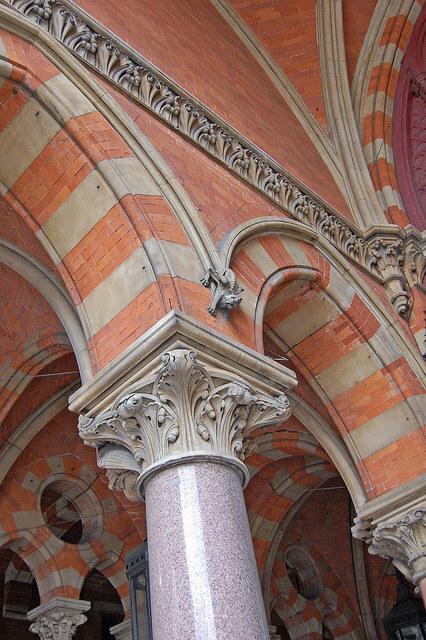 As in the rest of the restoration of St Pancras, Britain’s grandest railway station, these superb pieces of detailing contribute to something which is far greater even than the sum of parts as gorgeous as these. Lansley, Alistair (2008): The Transformation of St Pancras Station. Laurence King: London. Bradley, Simon (2007): St Pancras Station. Profile Books: London. Simmons, Jack and Thorne, Robert (2003): St Pancras Station. Historical Publications: Whitstable. It’s not good, is it? Not a lot of people know this but… Gilbert Scott also (re)built Brownsover Hall, just outside Rugby (https://www.brownsoverhall.co.uk/gallery.html). The internal features are the living spit of the inner areas of St Pancras stations . For instance, Brownover Hall’s doorways with their massive hinges look exactly the same as those in the station did in the 1970s, when I worked on the upper floors. The very top floor in those days was a graveyard for old furniture and I remember vast bedroom wardrobes , covered in cobwebs and dust and made with carved wood that looked more ornate than most gothic cathedrals. They must have been the original fittings and I suspect they all went on a giant bonfire.